Josh is Managing Director of Slattery Australia, a leading national Quantity Surveying and Cost Management company. 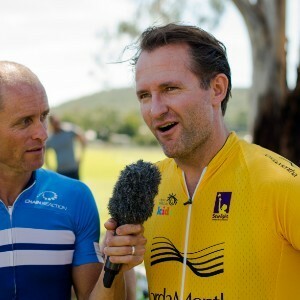 Josh is a keen cyclist and rides with the Kings Men Cycling Club. He is thrilled to be taking part in his eighth Chain Reaction Challenge. Complete the ride with no hands, I'll double it! Great effort mate, good luck! Continue the fine cause, good luck from LUS. Enjoy the ride. Keep safe. Thank you for slogging away to educate us more fortunate, about those less fortunate. Good luck old boy! Ride hard and great effort again! Awesome Effort, Well done mate very impressive. Keep riding for the cause! Good luck with the ride Josh! The wonderful people at VSK and Stairlight, gave us respite and joy in the last years of our son's life. Well done Josh and I will ride with you next year. Great effort Josh, well done! Nice work Josh. A big week! You are fresh - hope it goes well Josh!! Go Doma Doma. Great cause!!! Best of luck Josh - great effort! You're an inspiration Josh; 8th year! Keep safe on the ride and enjoy. All the best Josh, well done yet again on the massive fundraising effort!